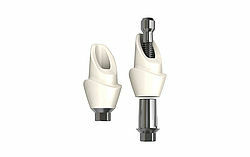 The internal taper connection with 45° medium taper angle and internal hex anti-rotation protection, tried and tested for over 20 years, was introduced with the launch of the first BEGO Semados® implants. BEGO Implant Systems offers a range of options for producing customised CAD/CAM prosthetics either yourself or through BEGO Medical GmbH. Adhesive abutments, CAD Positioners as well as a large range of customised CAD/CAM restorations are available for many Semados® implant systems. Depending on your clinical requirements and preferences, BEGO Implant Systems offers different possibilities for producing cement- or screw-retained crowns and bridge restorations. 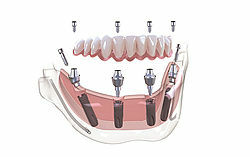 Thanks to the large selection, you are able to satisfy both the specific demands of the treatment situation and those of your patients in terms of functionality and aesthetics. 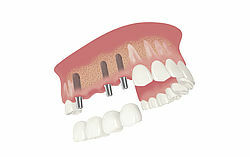 With the MultiPlus system BEGO Implant Systems offers you a solution for treating edentulous patients where only a limited amount of bone is available whilst avoiding large augmentations in awkward anatomical regions. Immediate restorations on 4 to 6 implants using specially designed screw-retained prosthetic abutments for edentulous patients offer both patients and dentists new options. 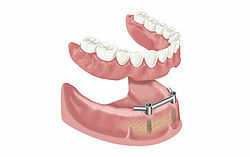 To ensure the optimal anchoring of implant-supported complete dentures, Semados® implant systems boast a wide selection of components with various anchoring types and geometries for individual patient cases.